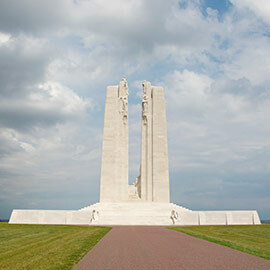 “Every year, we take undergraduate and graduate students to France and Belgium to visit the battlefields of the First and Second World Wars, so we too are part of the long tradition that Katrina is studying,” says Mark Humphries, director of the Laurier Centre for Military Strategic and Disarmament Studies, associate history professor, and Pasierbek’s PhD supervisor. Humphries, who is also the Dunkley Chair in War and the Canadian Experience, says that while it is important for students to learn about Canada’s military history, Pasierbek’s work shows that it is important to reflect on the unique nature of experiential learning and the ways in which those tactile experiences shape memory. In the final year of her undergraduate studies, Pasierbek was selected by the Canadian Battlefields Foundation to participate in a study tour — a 15-day journey guided by the work of historian Terry Copp, director emeritus of LCMSDS and professor emeritus of History. The question began Pasierbek’s mission to learn more about this Canadian interwar remembrance and pilgrimage to the front lines, but she found very limited research on the topic. She is now piecing together a bigger historical picture based on the experiences of individuals, families, veterans and organized group trips. In 1936, nearly 6,200 Canadian veterans, bereaved parents, and civilians travelled to northern France for the highly anticipated unveiling of the Canadian National Vimy Memorial. The memorial, which was designed by Canadian sculptor and architect Walter Seymour Allward and took 11 years to construct, is inscribed with the names of 11,825 Canadian soldiers who were missing or presumed dead in France during the First World War. Following the official dedication of the monument by King Edward VIII, Canadian pilgrims spent several days paying their respects in the cemeteries where Canada’s war dead were buried in France, and many continued on to Ypres, Belgium to witness the Last Post ceremony at the Menin Gate Memorial. Both Humphries and Pasierbek agree that understanding why veterans returned to the battlefields helps better understand war's legacy in Canada. Interested in learning more about Canada’s history in the First and Second World Wars? Find out more, including information on study tours, through the Laurier Centre for Military Strategic and Disarmament Studies.